undertakes a forensic examination of why poorly managed insulin and excessive carbohydrate intake damages the ability of brain cells to respire and may lead to Alzheimer’s and other lesser cognitive problems. Alzheimer’s is increasingly being referred to as “type 3 diabetes” and is becoming more prevalent as a disease. Travis Christofferson considers the role of metabolism in the development of cancer. A surprisingly old idea that we seem to have forgotten about as we searched for cancer’s genetic secret… which doesn’t seem to exist. A book Cancer Research UK should read. 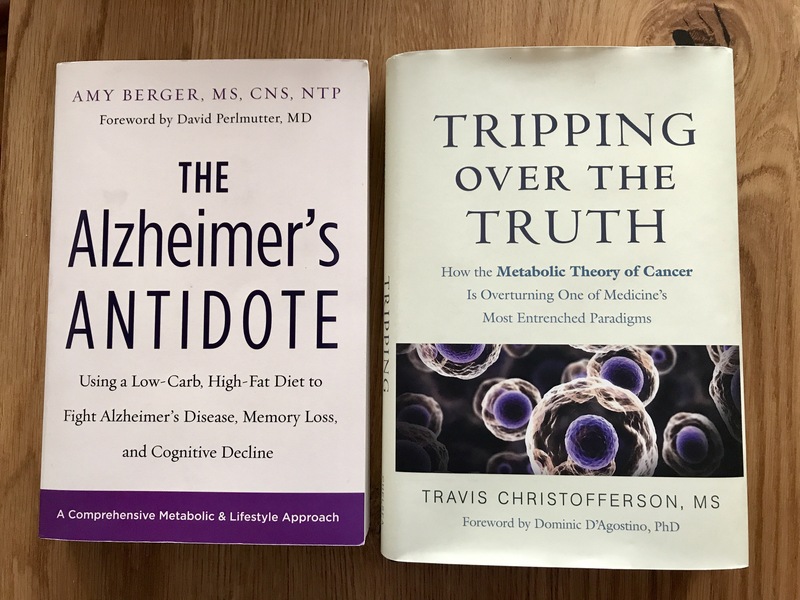 Obesity doesn’t cause cancer… obesity and cancer are both consequence of poor insulin control and general metabolic damage caused by the over consumption of carbohydrates. We simply forgot the truth. Its time we remembered it. The healthy human condition relies on fat metabolism not carbohydrate metabolism. Thats why are genes are programmed to store many many many times more calories as saturated fat rather than glucose. Listen to the background music. Given the choice of Alzheimer’s or cancer or something else, my advice would be die of something else. *In oncology, the Warburg effect is the observation that most cancer cells predominantly produce energy by a high rate of glycolysis followed by lactic acid fermentation in the cytosol,rather than by a comparatively low rate of glycolysis followed by oxidation of pyruvate in mitochondria as in most normal cells. The latter process is aerobic (uses oxygen). I don’t get home until about 8pm on a Thursday as I run a high intensity interval class in the evening. I’ve run the class for quite a few years now and I have a lovely group of super enthusiastic regulars who seem to enjoy the buzz from the intense work out. I don’t believe that high intensity interval training (HIIT) by itself is sufficient – “fitness” is a combination of respiratory efficiency, strength and flexibility- but it is a useful component of cardiovascular training. If you are doing it right, an HIIT work out should take you close to your maximum heart rate for brief intervals – no more than 30 seconds – followed by a recovery period at least as long as the work interval the objective being to get your heart rate back down before you send it back up in the next interval. There are loads of protocols available online using all sorts of equipment and none. Sprinting uphill and jogging back down is highly effective. Anyway back to my point, I get in late and I want something quick and easy and no fuss. 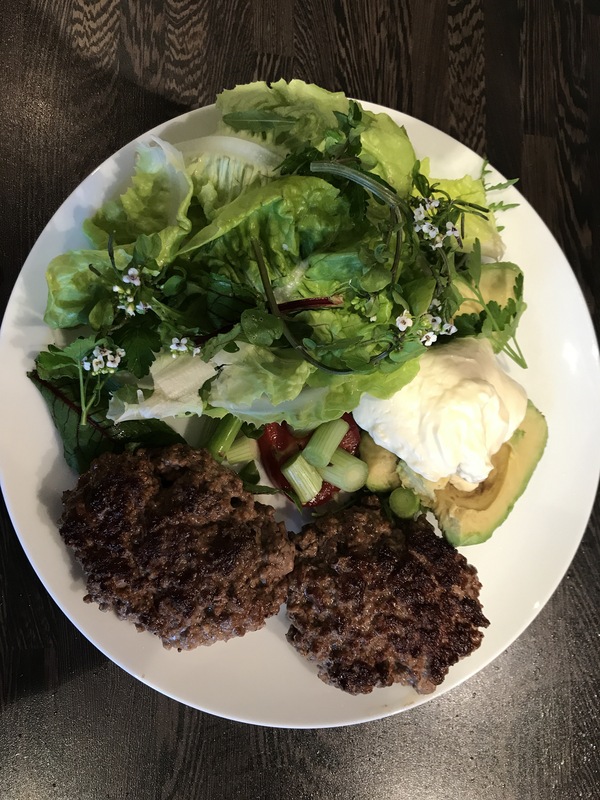 Rough and ready burgers and salad fit the bill perfectly. 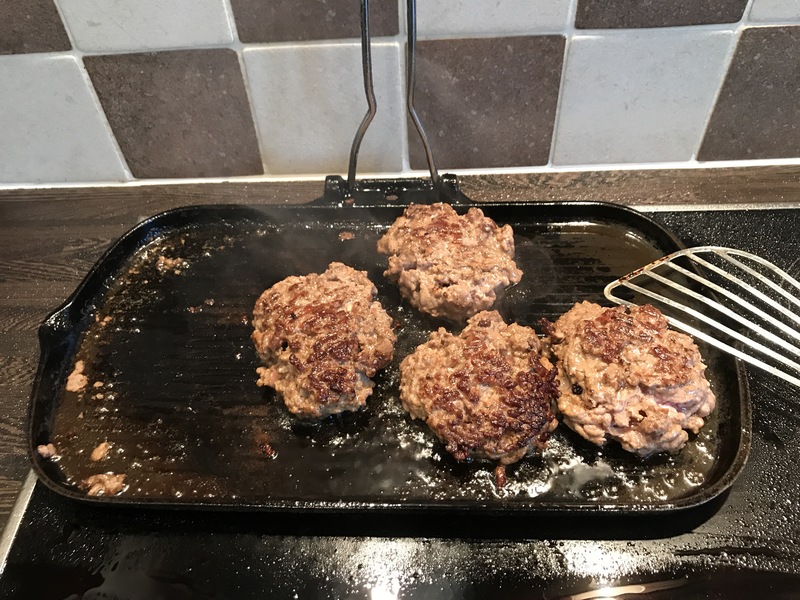 I take 500g of organic beef mince and roughly form it by hand into 4 patties and throw it on a griddle for about 15 minutes, turning every couple of minutes. While they are cooking I fish around in the refrigerator for whatever salad is available. This time of year it has mostly come from the garden. If there’s an avocado in there I will add that too as I think it goes great with burgers, it acts like lubricant as pure beef burgers can be a little dry. By the time I have got the salad on the plate with a spoon of real mayonnaise, the burgers are ready and my perfectly primal dinner is ready. The little flowers are watercress. All it needs now is a sprinkle of celtic salt and you’re good to go. Only 20 minutes start to sitting down to eat. Rough and ready Thursday night burgers. Perfect.